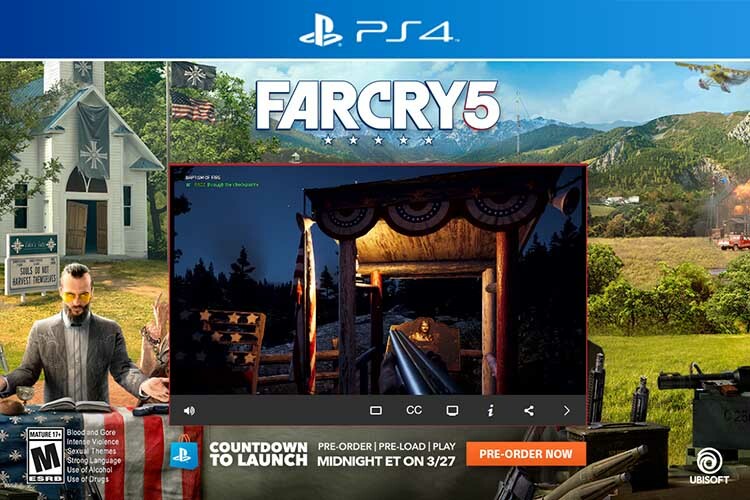 Ubisoft’s highly anticipated Far Cry 5 is scheduled to launch later today and Sony is running a promotional event on the PlayStation Store to mark the occasion. The promotional event has been divided into quests and players can win exciting rewards, including a 20% discount code, for completing the quests. To earn the discount code, players will have to watch the Far Cry 5 Countdown to Launch on the PlayStation store. The discount code, which is only valid in North and South America, will allow players to get a 20% discount on a single purchase made on the PlayStation Store. The discount code will be valid until midnight April 30, so gamers will have plenty of time to decide what to purchase. Keep in mind that the quests will only last until 8AM PT on March 27. Along with the discount code quest, Sony is also hosting a PlayStation Store and Far Cry 5 Sweepstakes. In order to participate in the sweepstakes, you will have to watch the Far Cry 5 Announce Trailer on the PlayStation Store. One lucky participant will be awarded a PS4 Pro 1TB console in a custom Far Cry 5 case for taking part in the sweepstakes, however, the offer is limited to US citizens. A bunch of other smaller quests will award players will full body avatars. You can win a Far Cry 5 Boomer Avatar by watching the Far Cry 5 Story trailer, a Grace Avatar by watching the Far Cry 5 Character Spotlight: Grace Armstrong – Gun for Hire video, the Hurk Avatar by watching the Far Cry 5 Character Spotlight: Hurk – Gun for Hire video, and the Nick Rye Avatar by watching the Far Cry 5 Character Spotlight: Nick Rye – Gun for Hire video. Unlike other rewards, which are limited to certain regions, the Avatar rewards will be open to all PSN account holders. For the complete eligibility criteria, you can visit the quest page on the PlayStation Store.